Let’s start saying that New Zealand is a fascinating land to discover, in which Nature definitely triumphs! Therefore it would take a lifetime to explore it in every hidden corner. Mainly due to economic reasons, we decide to visit this country in 18 days. Indeed New Zealand is also quite expensive, especially if you choose to do activities such as bungee jumping, skydiving and so on. The most efficient way to cross it from North to South (or vice versa) is undoubtedly by car which allows you to independently move around. Public buses are instead sporadic and do not cover the vast uninhabited territory. Many backpackers also prefer to do hitchhiking. It seems indeed to be quite safe here, but it has pros and cons regarding the time-wasting and deviations on the itinerary sometimes required. Other people - especially between the ages of 18 and 22 years old - usually buy organized tours with companies like Kiwi experience but with fixed dates and itineraries (and still expensive). If you decide to travel for just a few weeks, then the cheapest option is to rent a car (if you are travelling for several months - probably on a working holiday visa - then it is definitely better to buy it). 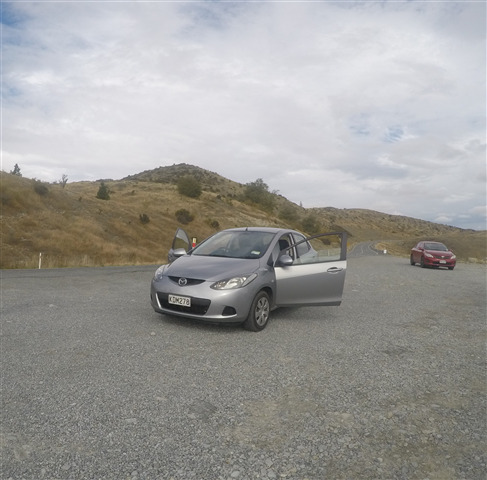 We choose the company Omega rental car after a comparative search on the web and we pay a rental fee of $580 (New Zealand Dollars) for 18 days. We strongly recommend adding the full-insurance for about 15 NZD a day. Indeed the roads here (at least during this period that is March) are full of ongoing works so it’s better to avoid stone-chips damages (it happened to us and we did not have any insurance!). An important thing is to book in advance the ferry to carry the car from North to South in order to save some money. Also, check with the car rental company if there are extra costs to return your car on the other island (it is usually specified when you book online). The ferry ticket is available through two companies - BlueBridge or Interislander – and it costs approximately 60 NZD per person and 110 NZD per car. It takes about 3 hours but the landscape is really beautiful. Regarding the price of petrol, it increases if going from North to South: on average in the North Island, it costs NZD 1.8 per litre, while in the South not less than 2.2 NZD. In regards to the type of accommodation, since we do not have a van where to sleep, we decide to use the Couchsurfing community (https://www.couchsurfing.com/), already used previously during our trips. It basically consists of a community of travellers, especially backpackers, who decide to help each other by offering a bed/sofa/floor to other travellers, completely free of charge. The main idea behind is to share travel and life experiences with them, in exchange for cooking a typical food of your country or whatever you prefer as a sign of gratitude. The most beautiful aspect is the opportunity to get to know local people who help you to better understand the culture and the traditions of the place. It is also a way to make new friends around the world, thus creating a sort of network of people linked by the common passion of travelling. It makes you still believe in the good and generous side of the human being. Moreover, Couchsurfing is a great chance to contribute to the growth of responsible tourism, by respecting both the place and the people who host you. During this trip, we use Couchsurfing for 10 nights out of 18. We choose a hostel just when travelling in areas particularly uninhabited hence with no people able to host us. On average, the price of a bed in a dormitory varies from NZD 25 to 35, but in general, they are pretty good in terms of cleaning and services offered. Finally, the distance covered during this trip is extremely long for such a short time. Therefore some days we even drive for 6 hours. On average we drive for 3 hours a day (considering also days in which we don’t move at all) for a total of 4000 km. We can say then that 18 days will probably not be enough if you want to spend a lot of time practising all the sports or hiking most of the trails available here; but it is enough to have a general idea of the beauty that this country has to offer, especially if you are travelling on a budget. Moreover, we highly recommend staying longer on the South Island since you will find here the wildest and unspoilt landscapes, undoubtedly able to take your breath away!